When hunger strikes in Chengdu the intrepid backpacker sets out to eat as the locals do, huo guo (hot pot) style. 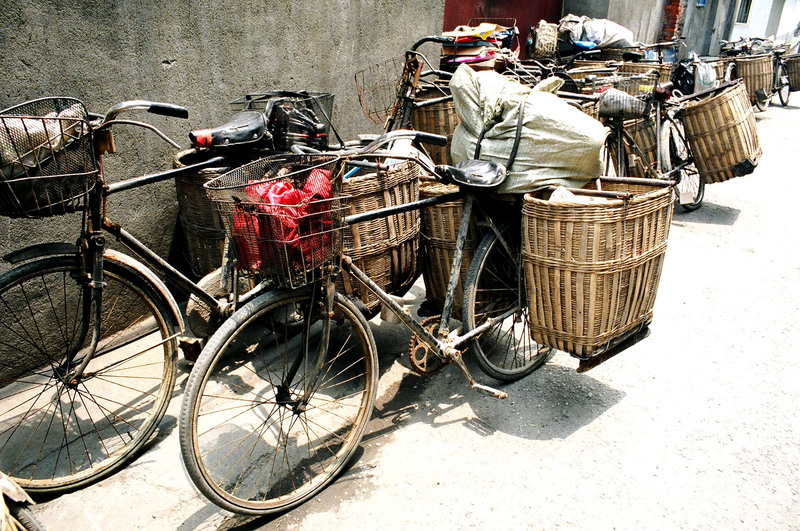 So along with a few other backpackers I had met in my hostel I wondered down the small alleys in the back streets of Chengdu in search of sustenance. The search took us past old men playing mahjong on tattered wooden tables, past smoky internet cafes packed with gamers, and past random machinery shops to a hot pot place that looked busy. We sat at a round table and the linoleum floor was damp and sticky with bits of food scattered about. The concept of a hot pot meal is to grab a bunch of small sticks of food on skewers and place them in the pot of boiling water sitting over a propane flame in the middle of your table. At the end of the meal the waiter counts the number of sticks in a bin and charges you by the stick. This sounds easy enough. 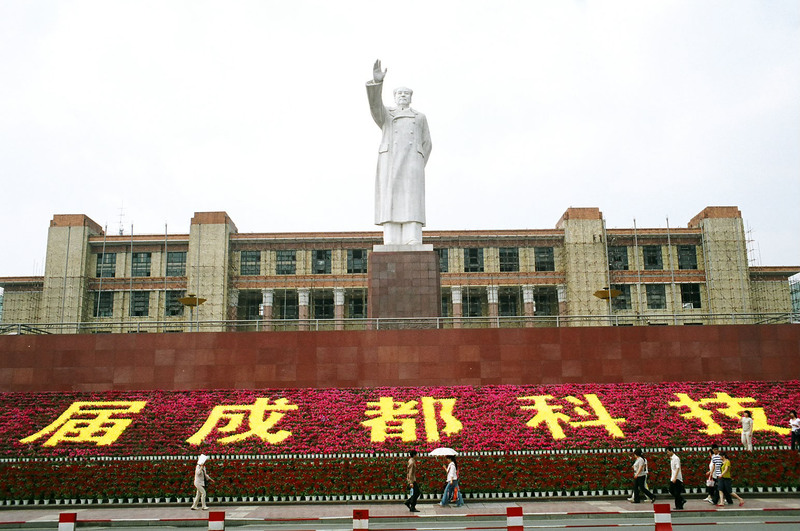 Like any large Chinese city there is the requisite towering statue of Mao Zedong stoically gazing upon the city above a huge bed of flowers. Elsewhere in the city a visit to the people's park is a pleasant way to spend an afternoon. Citizens stroll about the shady greens, assorted monuments, and even a diminutive amusement park. Families dine in tea houses overlooking a small lagoon where kids paddle small boats under tiny bridges. Wunshu temple offers another pleasant respite from the rest of the city. Fragrant incenses burn from large vases in front of Buddha statues as old men and women perform tai chi exercises under the shade of the temples ancient trees. I had arrived in Shanghai on a late evening and as my taxi zipped toward central Shanghai I gazed out the window and smiled. Nearing the center the taxi navigated the massive tangles of elevated avenues and highways diving up and down like an urban roller coaster of sorts. I had always imagined Shanghai to be a place ripe with excitement and as the taxi neared central Shanghai with the night breeze blowing and neon lights reflecting everywhere I was fairly certain I would not be disappointed. I made my way to a hostel and then headed to one of Shanghai's jewels, the Bund. Teaming with energy, The Bund is a 1.5 Km waterfront promenade running along the Haungpu river. The promenade is set against a backdrop of massive flood lit colonial era buildings on one side and the Manhattan like neon skyline of the Pudong district gleaming on the other side across the river. Ascending from the side streets to the elevated promenade the splendor of Shanghai becomes readily apparent. The Bund is buzzing with locals and tourists alike out for a nighttime stroll, vendors hawking post cards and tacky souvenirs, touts handing out flyers, and kites flying high basking bright in the floodlights against the black sky. Emerging from a set of stairs going up to the Bund I was greeted by a random fireworks display lighting up the sky. The fireworks burst even brighter than the endless horizon of massive skyscrapers, towering apartment blocks and myriad neon billboards across the river. A few other buildings across the river were transformed into giant jumbotron TV's, as images moved across the entirety of the massive glass panels. The river it seemed was just as busy as its banks with large cargo ships rolling through the low lying fog with their deep baritone horns bellowing loud, echoing from bank to bank. Smaller junk ships, dinner cruise ships, and even boats with neon advertisements all mingled in the dark waters. 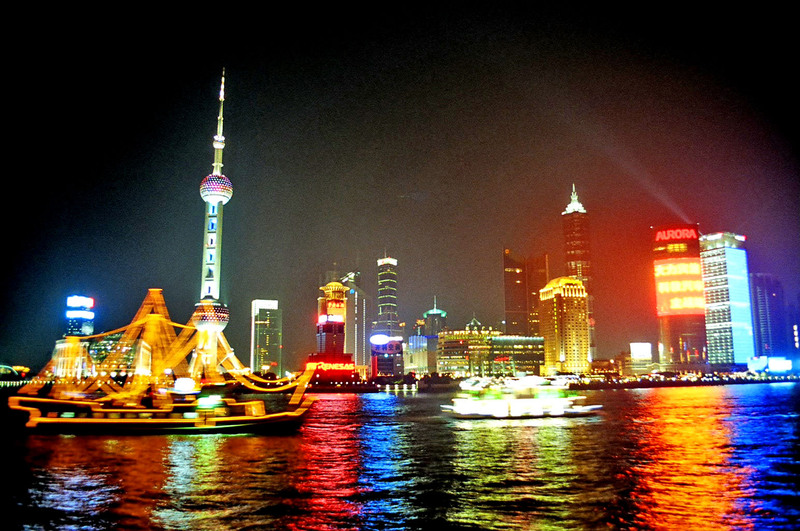 Situated just below the Yangtze delta facing the East China Sea, Shanghai is the world's biggest port. 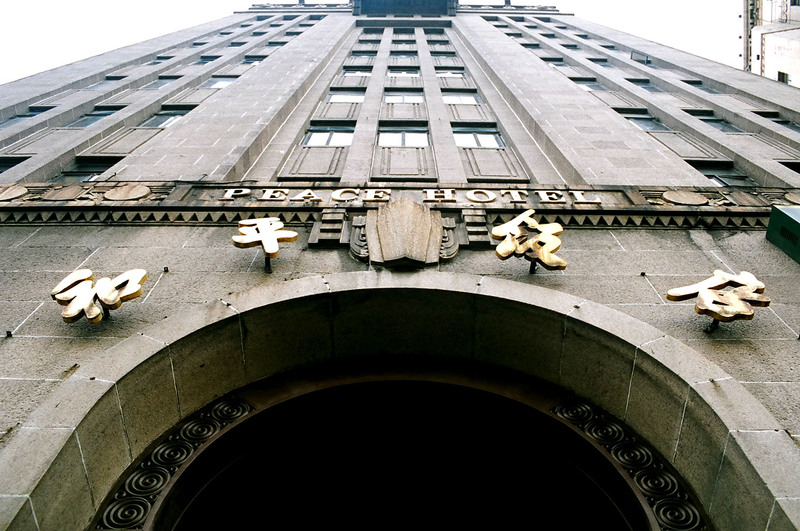 Early in the 20th century the Bund was the financial hub of East Asia with its abundant art deco banks, trading houses, and consulates. One the more interesting buildings is the famous Palace Hotel, once frequented by the likes of Noel Coward, George Bernard Shaw, Charlie Chaplin, and others. Pudong across the river is one of the world's largest construction sites with new skyscrapers sprouting like mushrooms all the time. Elsewhere in Shanghai there are the trendy clubs, boutiques, and discos of the French Concession Area. At some point I wondered into one outdoor market replete with bootleg software, dvd's, and fake designer clothing where a large red banner leading to the market read "respect intellectual property". The humor was not lost on me as I took home a cheap copy of the latest version of Photoshop CS. Shanghai is also home to the world's largest Magnetic Levitation Train the so called "Maglev". Magnets along the track's entirety keep the large trains slightly elevated above the tract, thus completely eliminating friction and allowing the train to reach speeds of 270 miles per hour. I took this train back to the airport, at this warp like speed the landscapes seem to blur and at one point where the track ran parallel to a large freeway the cars looked like they were standing still relative to the train.